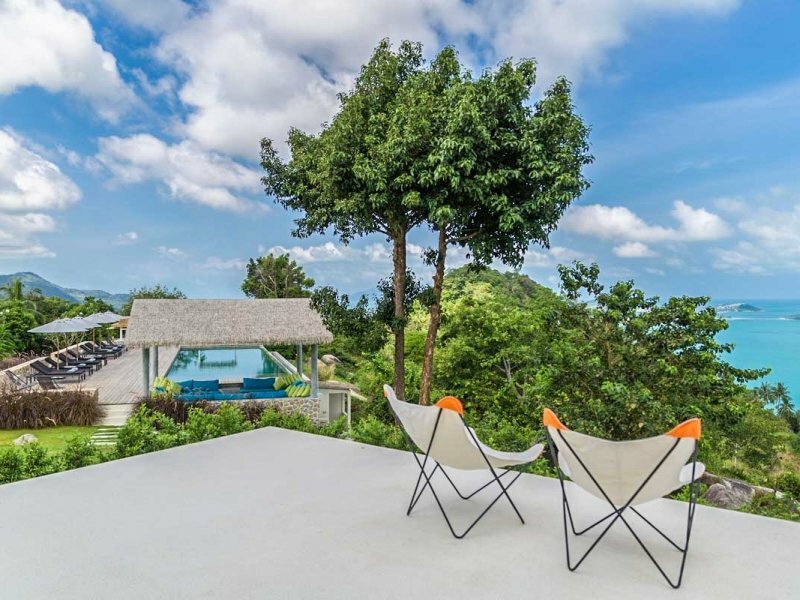 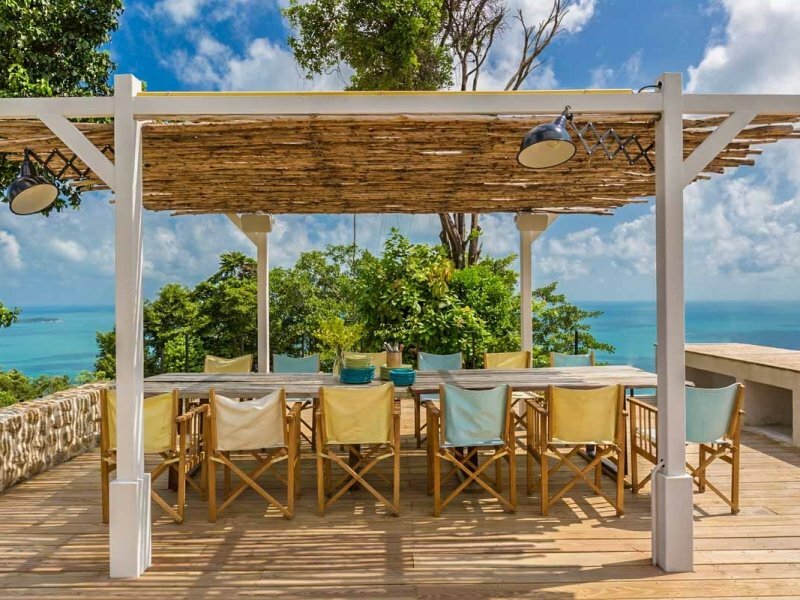 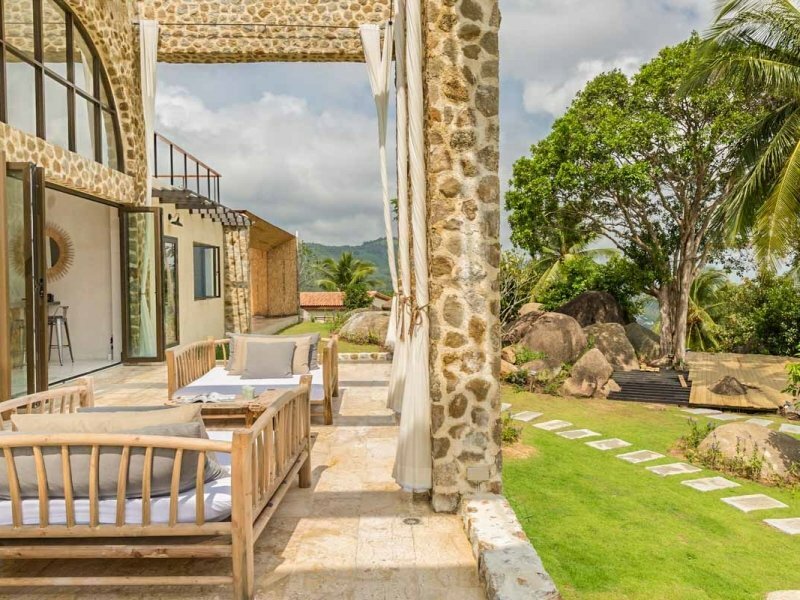 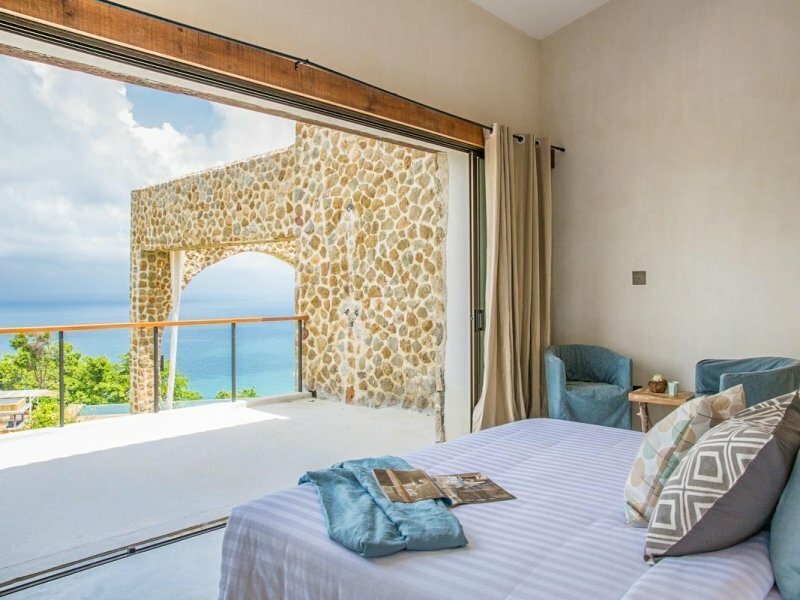 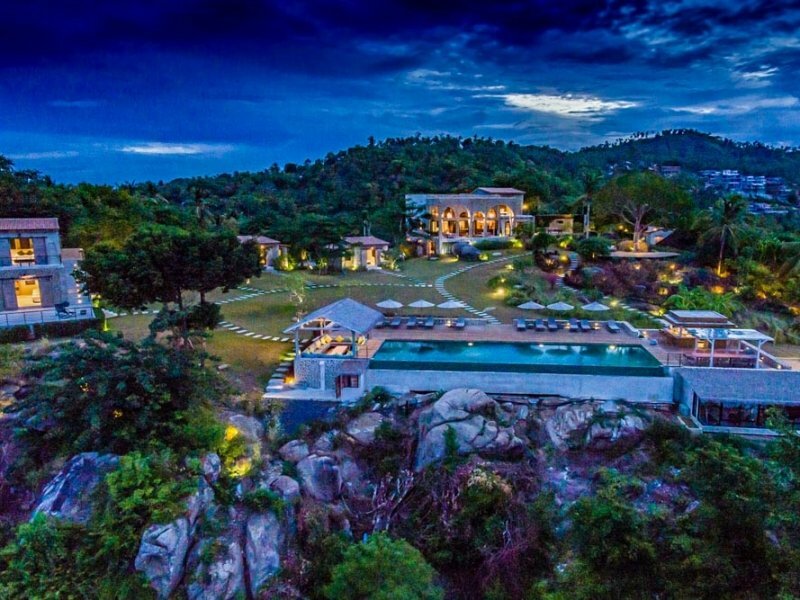 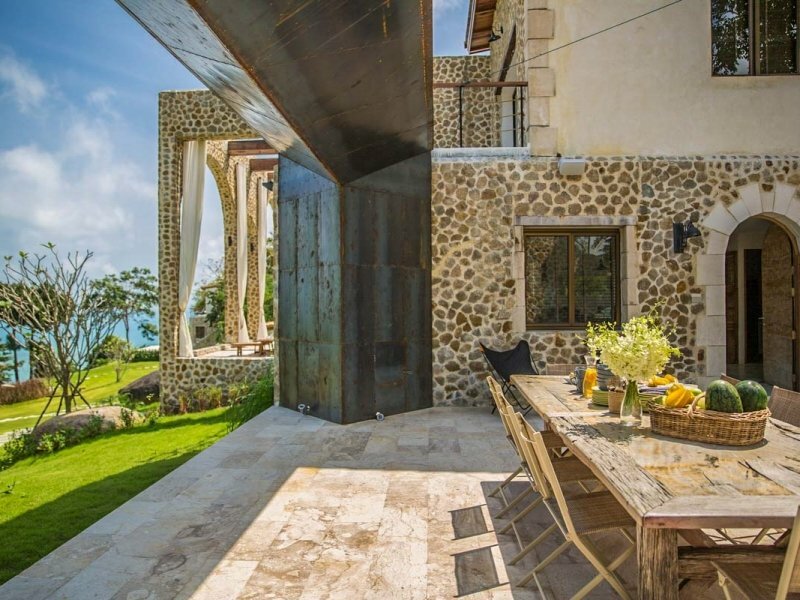 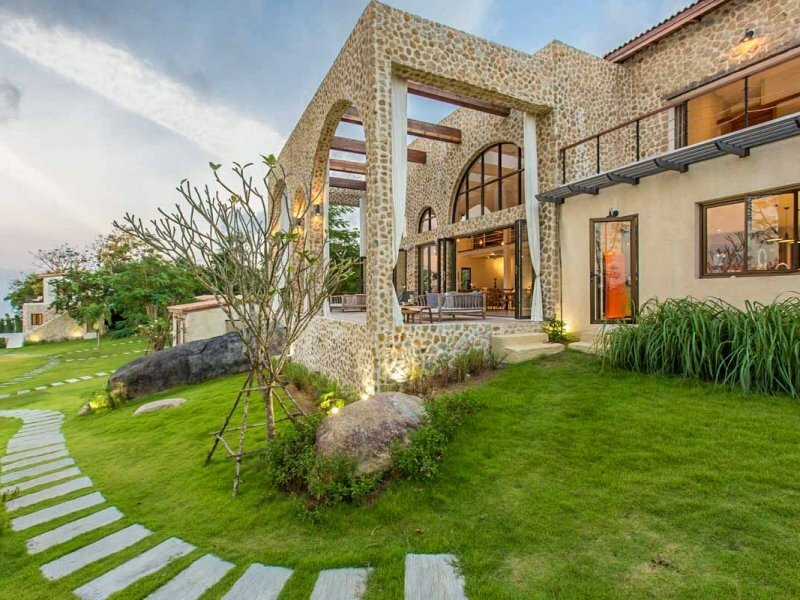 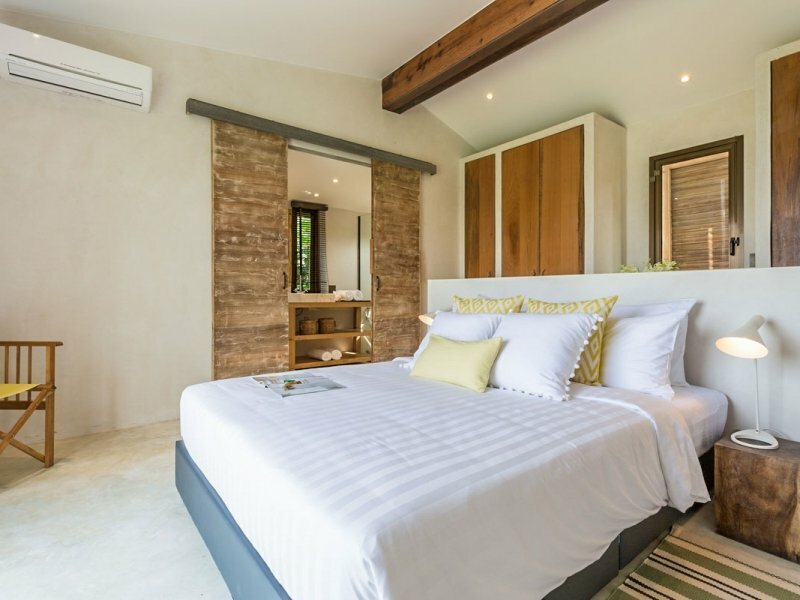 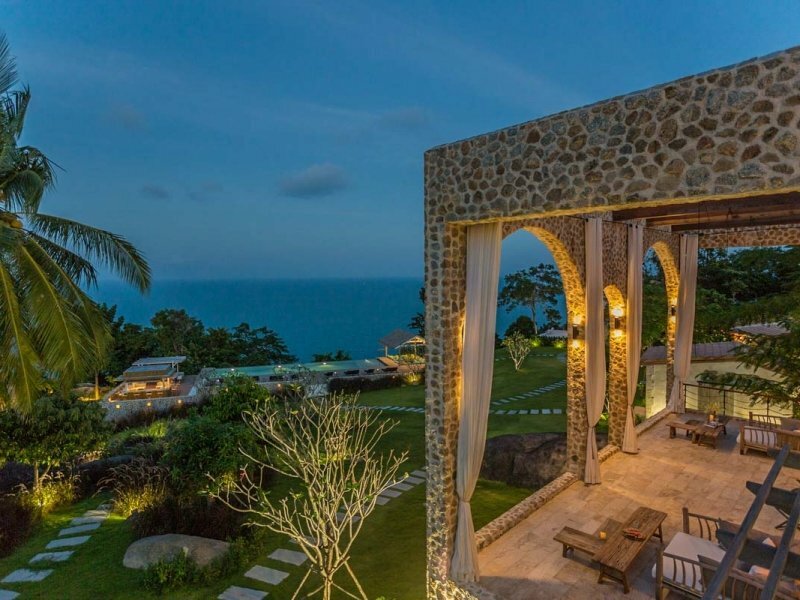 The spectacular 7-bedroomed Koh Koon complete with 2 kid’s rooms sleeping 8 sprawls over 7 Rai of hillside overlooking Chaweng Bay, and could easily be mistaken for a Mediterranean countryside retreat. 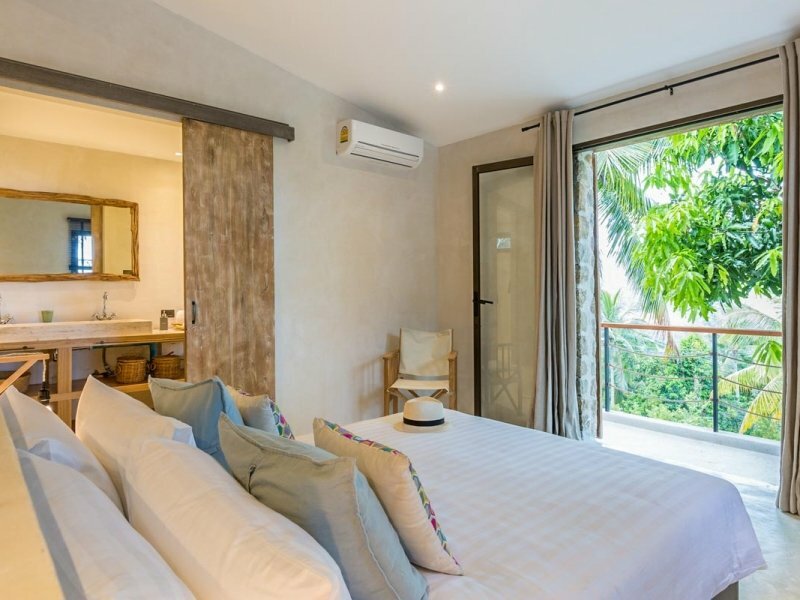 Koh Koon’s main building houses the communal living space, as well as the master bedroom, and a library with business center. 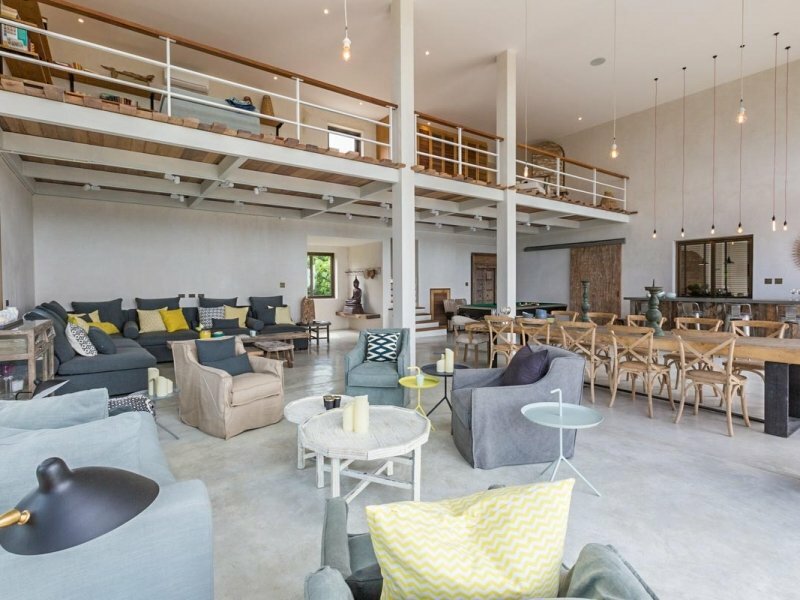 Downstairs, you’ll find an open-plan living and dining area, with oversized couches covered in cotton and linens in muted shades, quirky lighting, art pieces and collectibles. 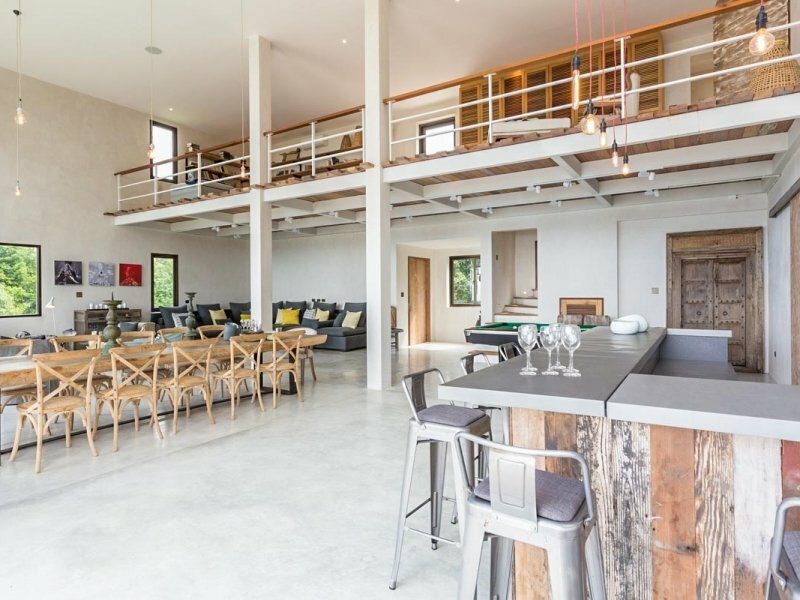 This open-plan, double-volume sociable room is ideal for entertaining, and one can easily imagine wine flowing, music playing, and plenty of laughter, accompanied by excellent food prepared by the in-house chef in the adjoining country kitchen. 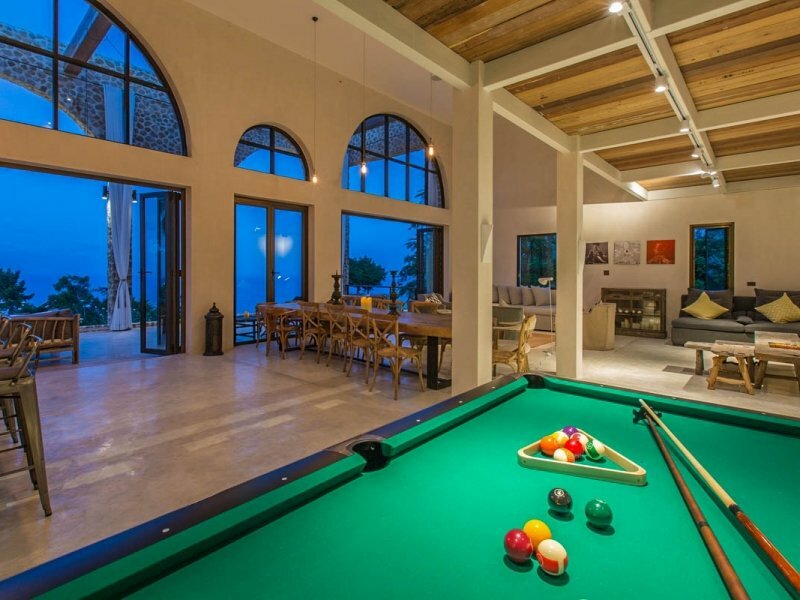 A pool table, football, and a dartboard add to the entertainment. 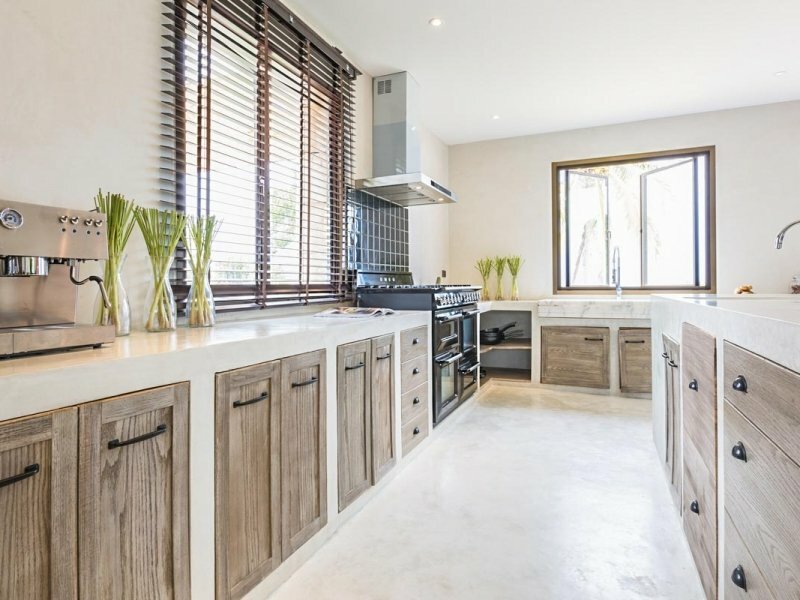 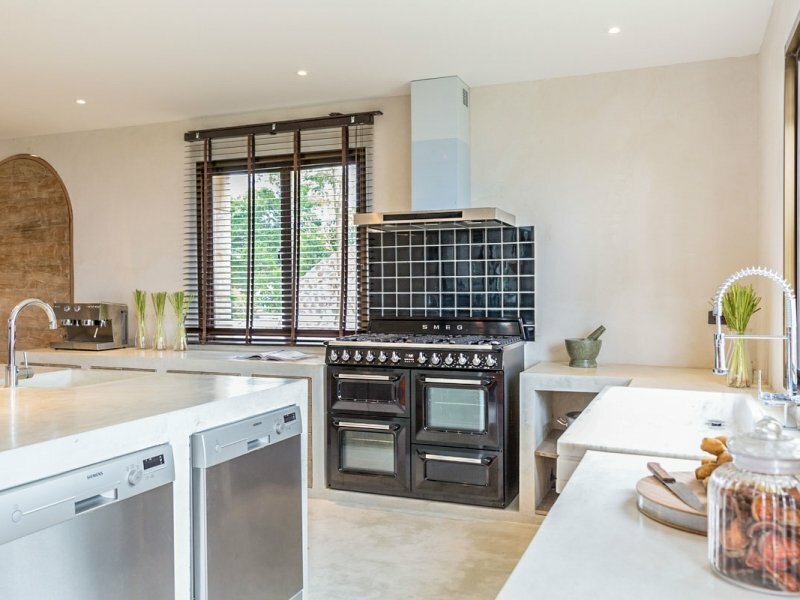 The kitchen comes complete with Smeg appliances and plenty of space for the chef to prepare his delicious fare. 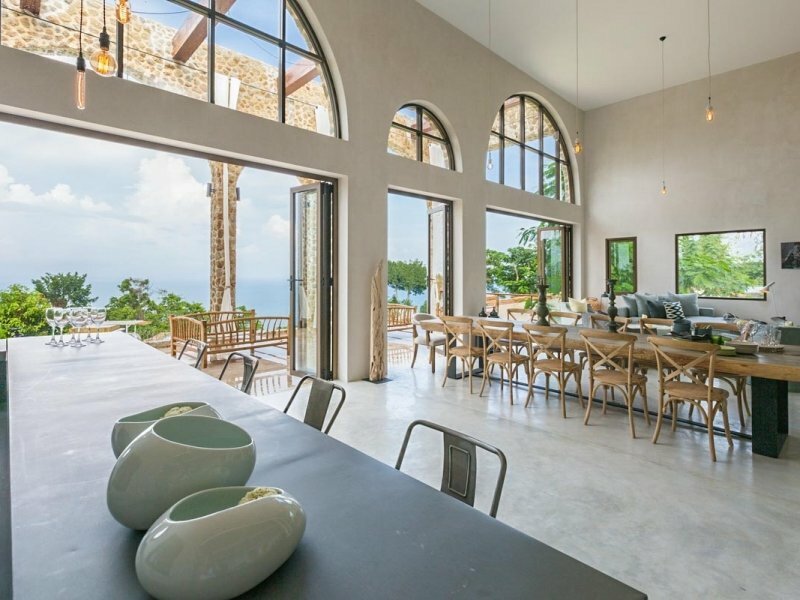 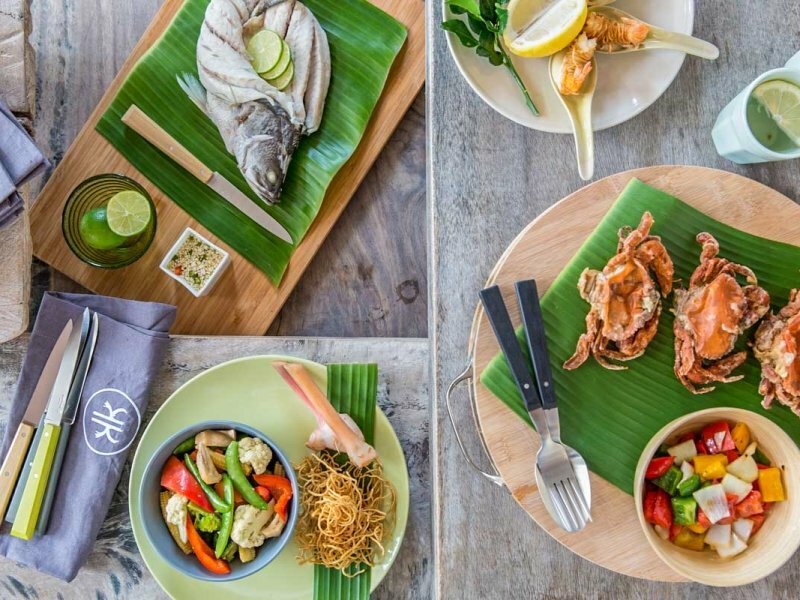 Whether its breakfast on the terrace, lunch in the pool dining sala, dinner indoors, or afternoon crepes and waffles on the pool deck, you’ll be well taken care of. 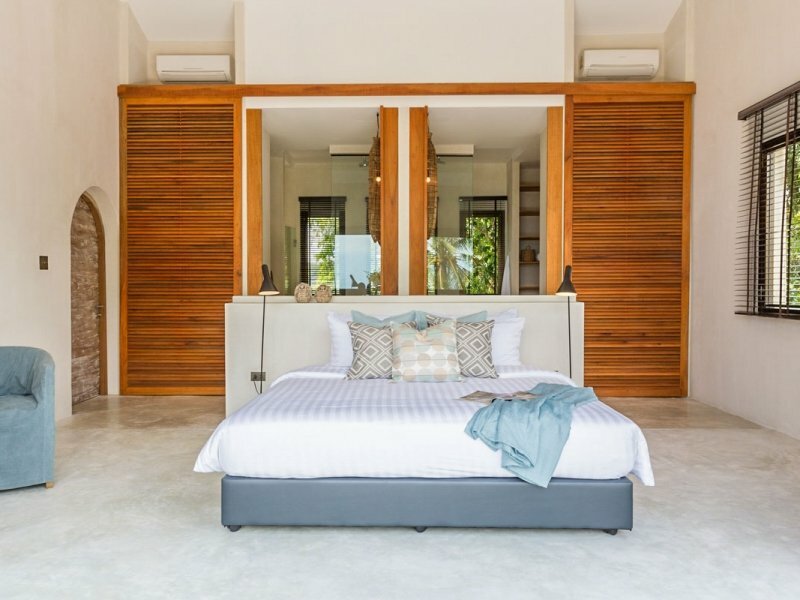 The master suite leads off from the library and offers ocean views from the bed as well as the private terrace, complete with outdoor shower. 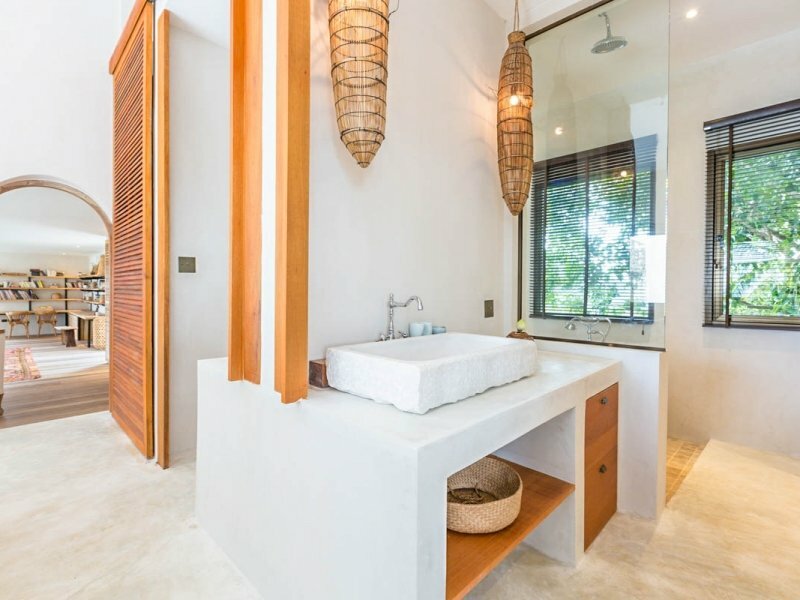 The ensuite bathroom boasts his-and-hers marble vanities, as well as a double rain shower. 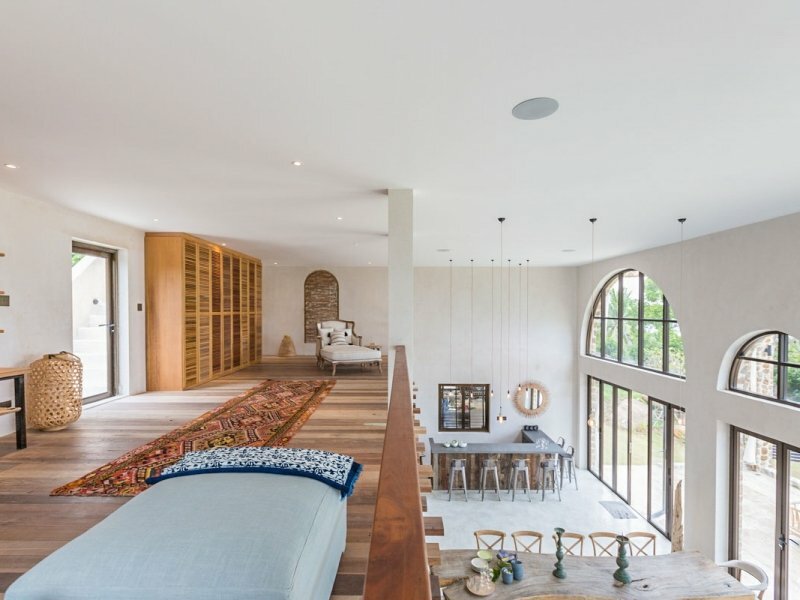 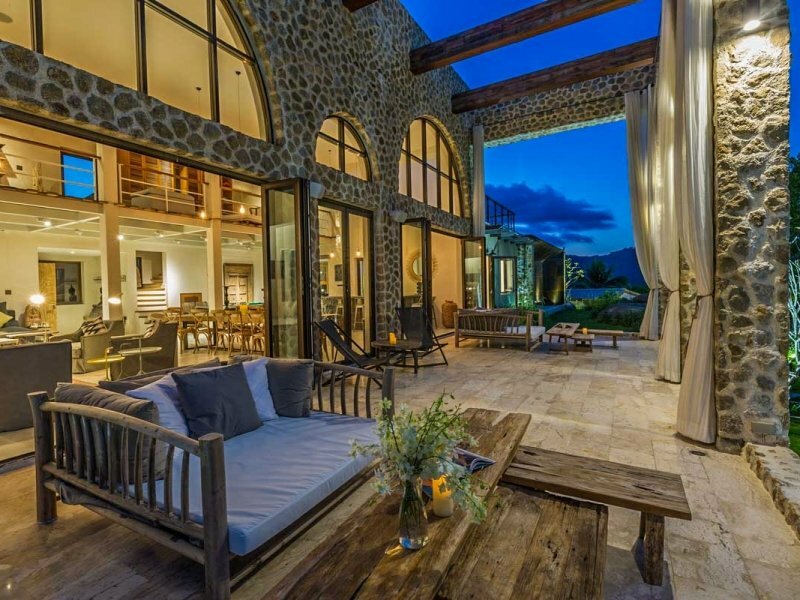 Below the main living pavilion lies a multi-purpose room, which can be used as a TV-lounge, a massage room, or even an additional sleeping area, should the eight bedrooms not be enough for your party. 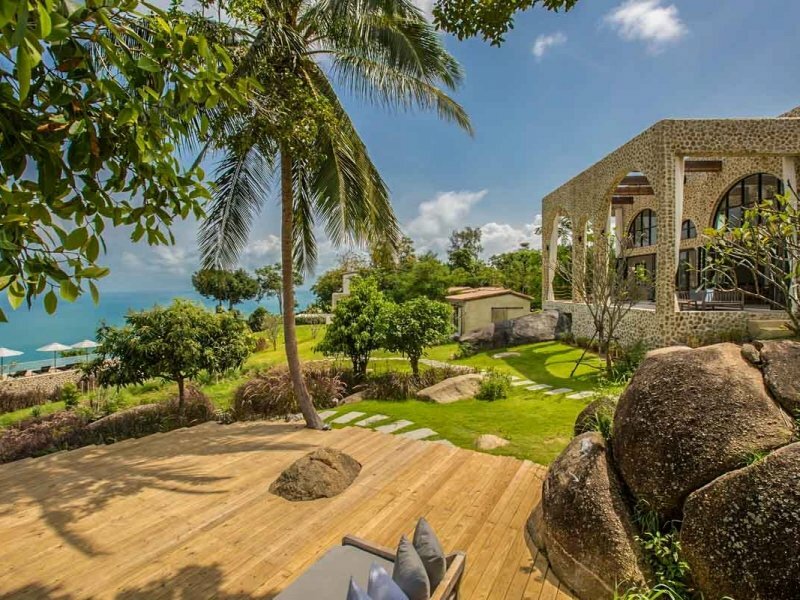 Koh Koon’s remaining 7 bedrooms are housed in 4 pavilions throughout the property. 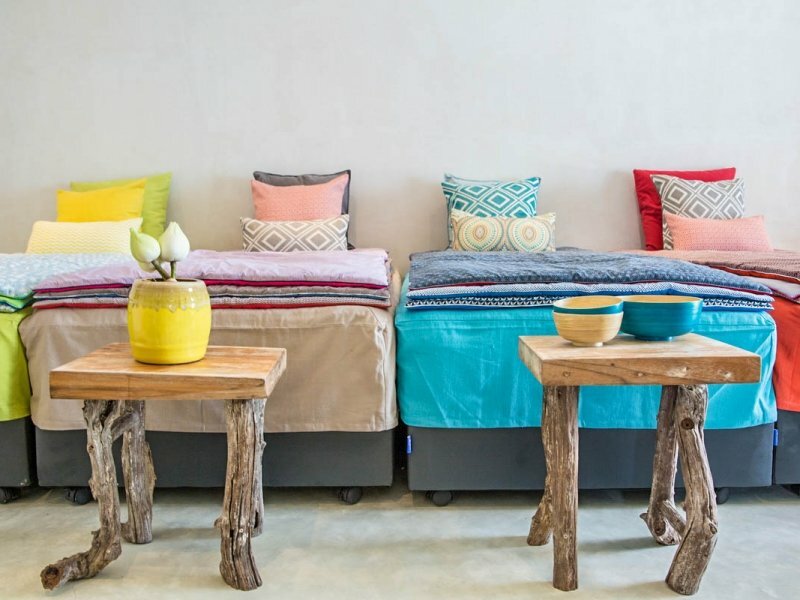 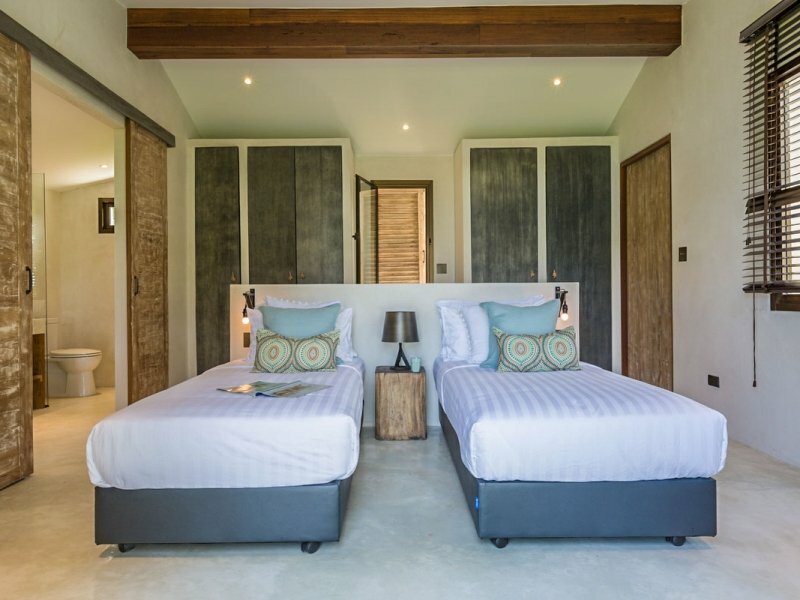 The Mountain View Villa holds 2 bedrooms – one with queen size bed, and the other with twin beds (not inter-leading). 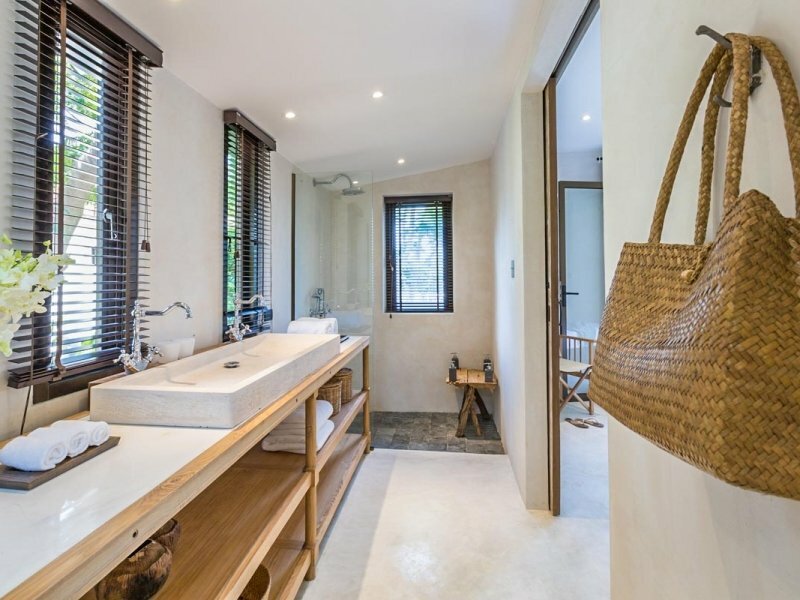 Each has its own ensuite bathroom, complete with double vanities and rain showers, as well as a terrace with seating. 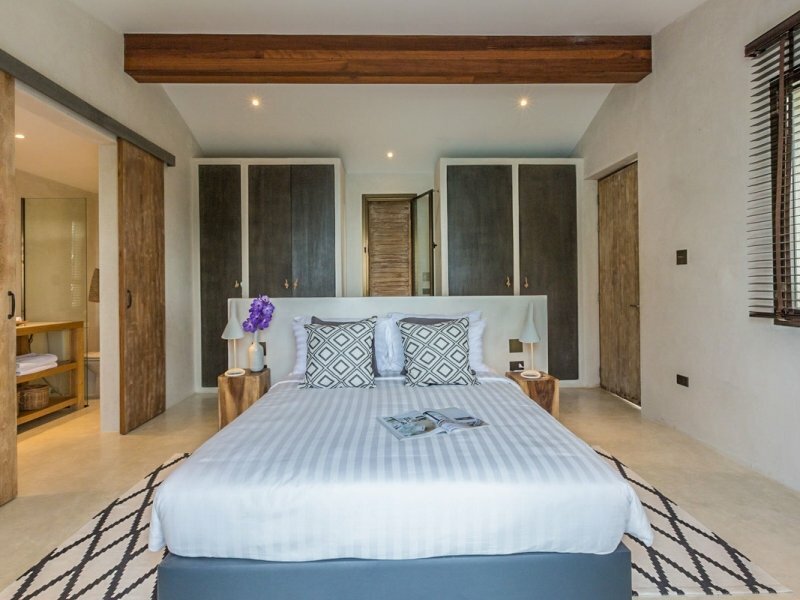 To the right of the swimming pool lies Alex Villa, with 2 bedrooms – upstairs holds a queen size bed, and downstairs, a large room holds 4 single beds, making this an ideal room for older children sharing. 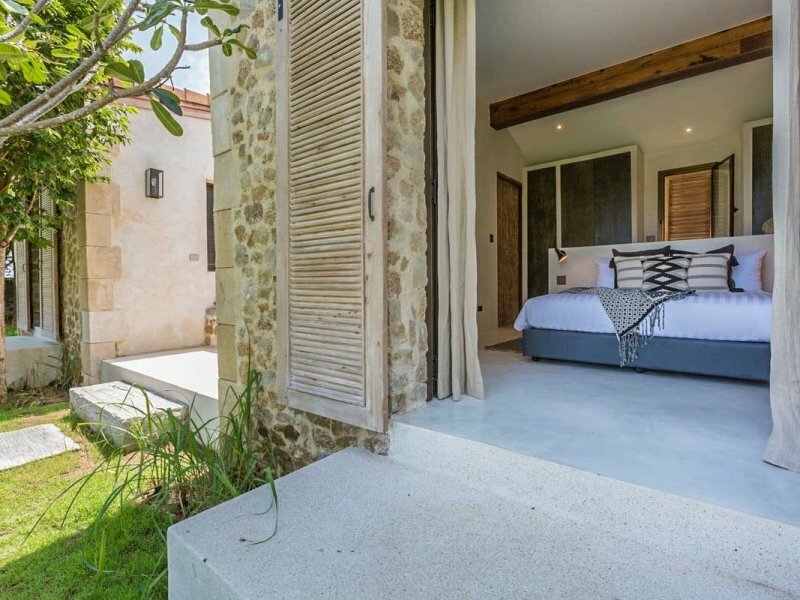 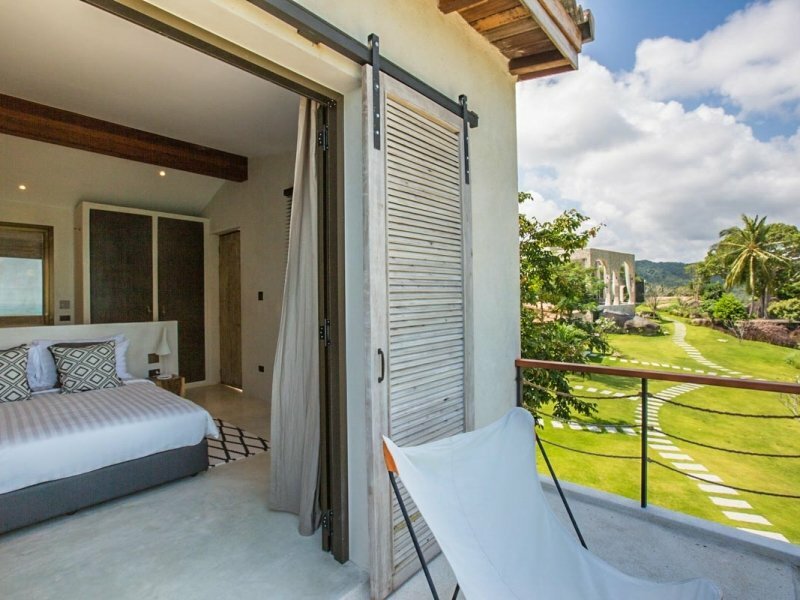 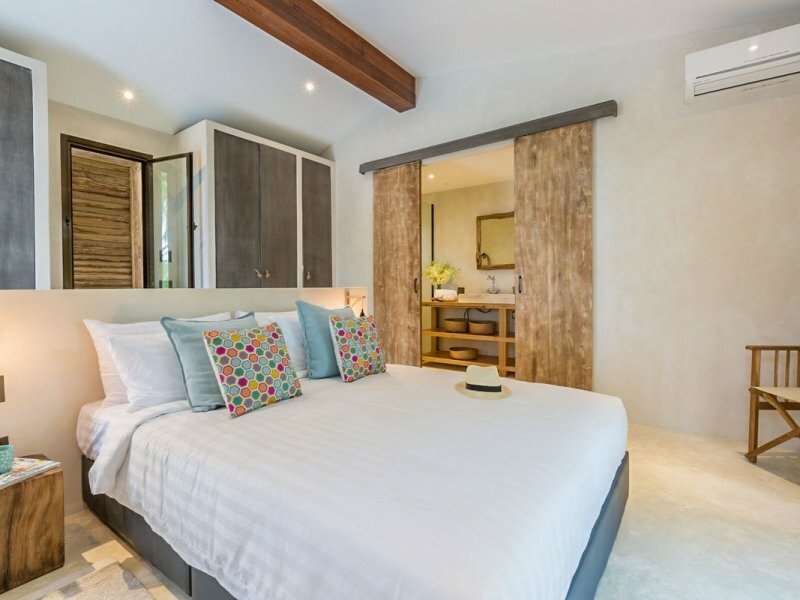 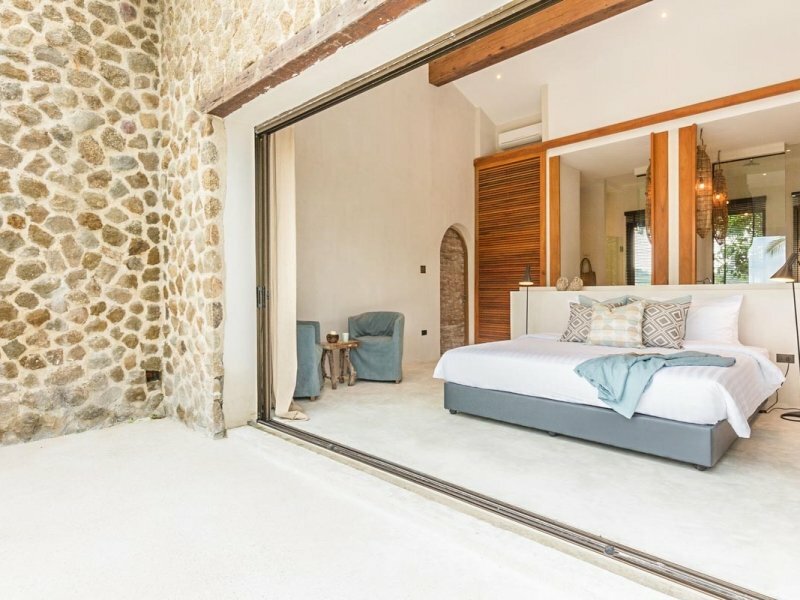 All bedrooms have ensuite bathrooms and are furnished with crisp, white linen, curtains as well as wooden shutters, air-conditioning and interesting bedside lighting. 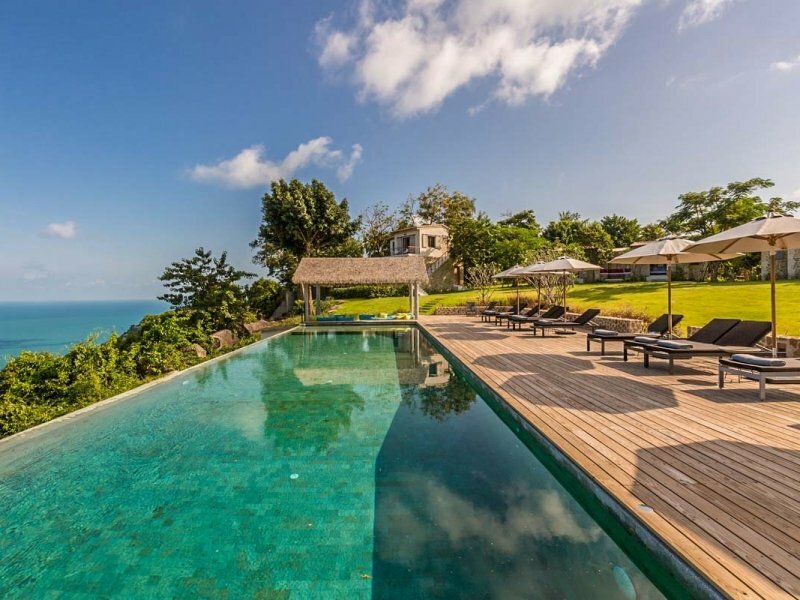 Situated below the main house, taking center stage in the garden, and boasting exceptional sea views, the expansive infinity pool is sunken into a wooden deck, and is flanked with plenty of sun-loungers and deck chairs. To one side lies a pool bar, along with a separate dining sala, and to another side, a covered pool lounge offers shaded seating. 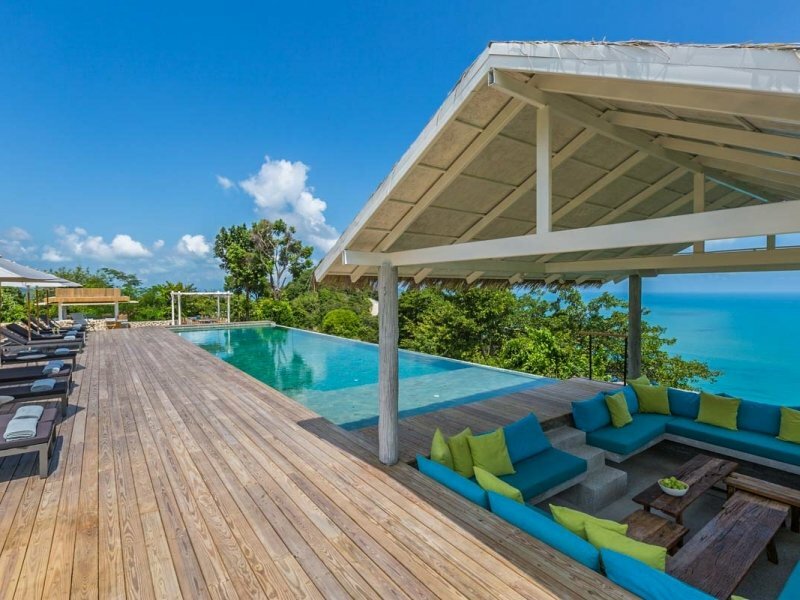 The pool terrace, with its many seating areas, makes an ideal place to gather in the day as a group. 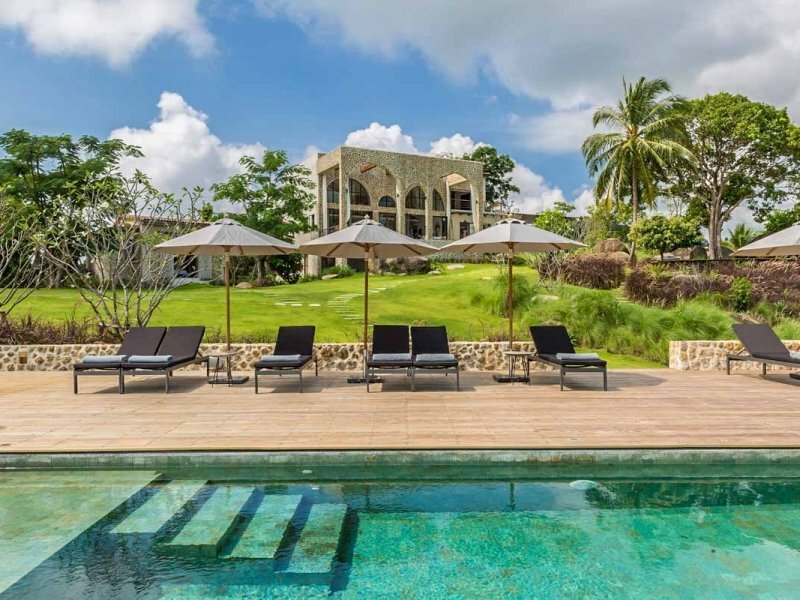 Bluetooth speakers located around the pool (as well as in the buildings) allow guests to play their own choice of music easily via their phones. 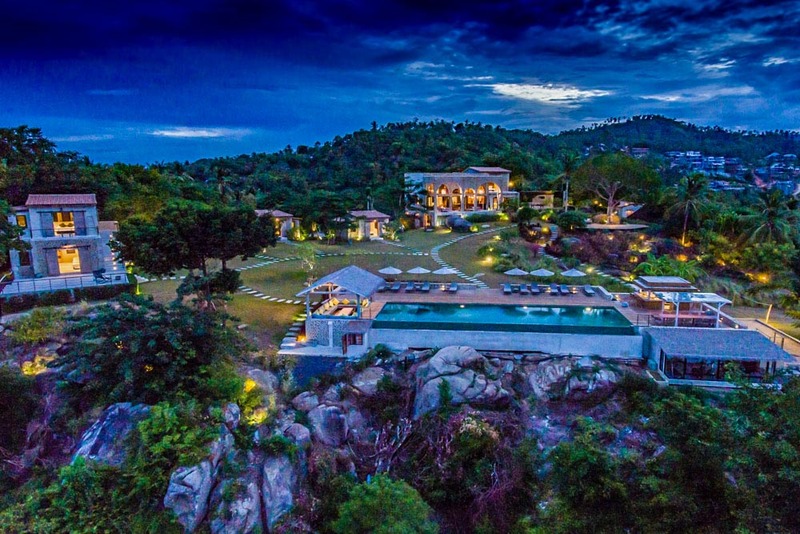 Koh Koon’s vast lawns are great for children to run, play and be children, and in the garden below the pool, guests can enjoy a friendly game of petanque boules court, or practice their golfing techniques on the putting green. 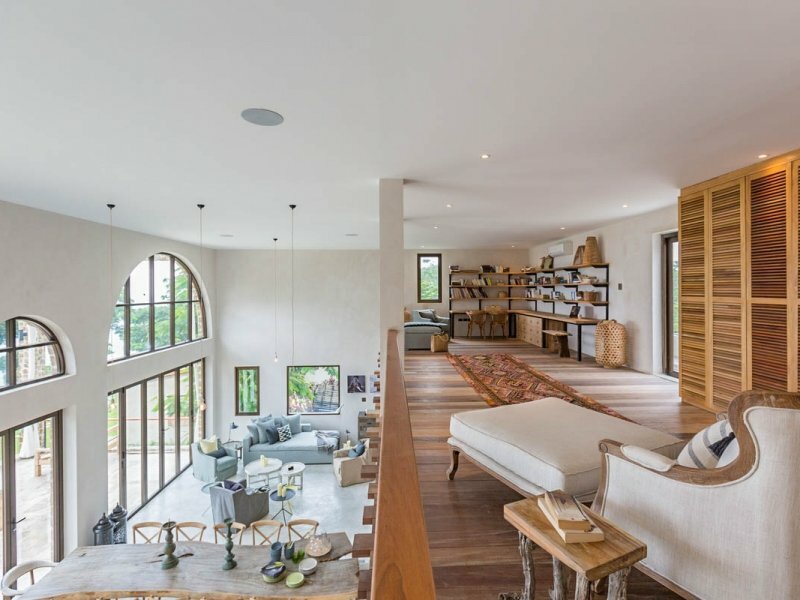 Higher up in the garden, just below the main building, sits a large function deck, built around a majestic tree. 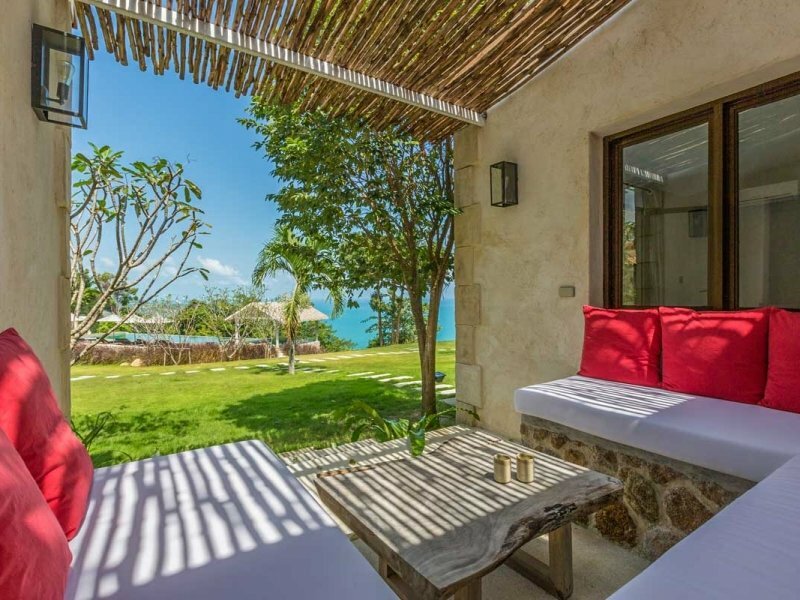 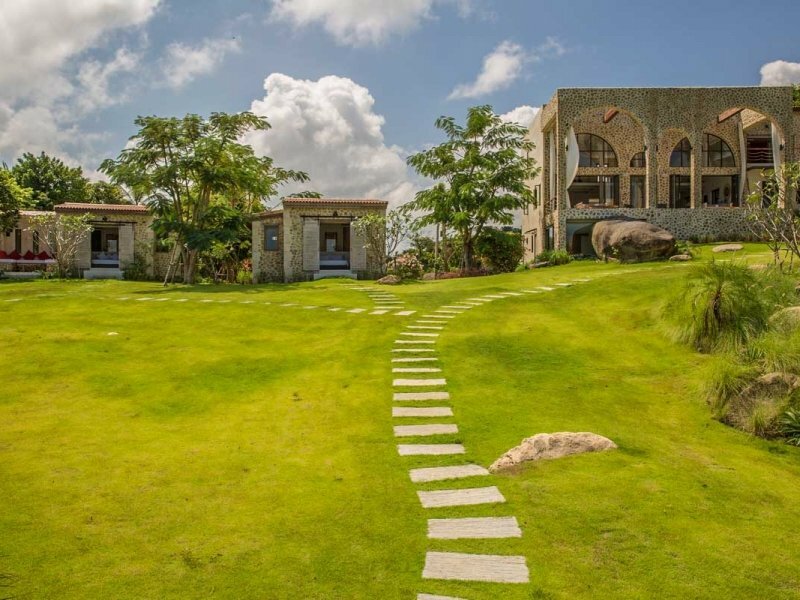 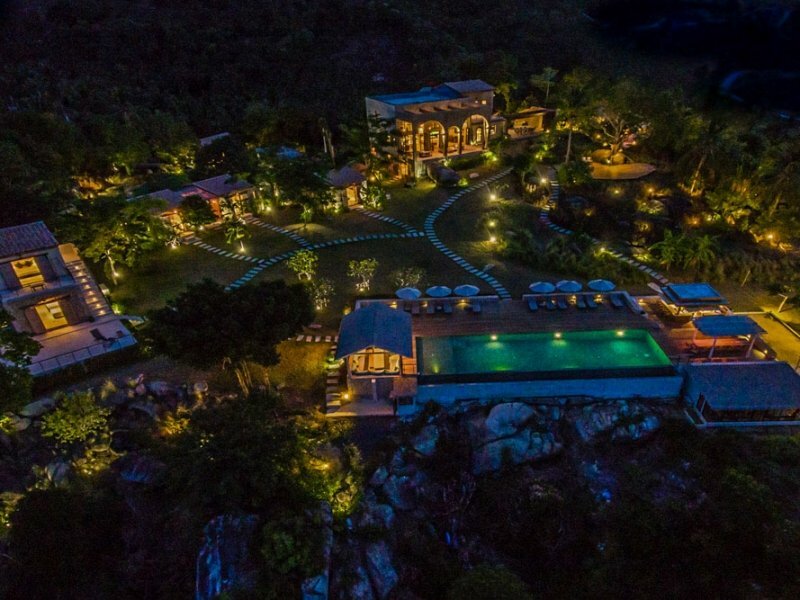 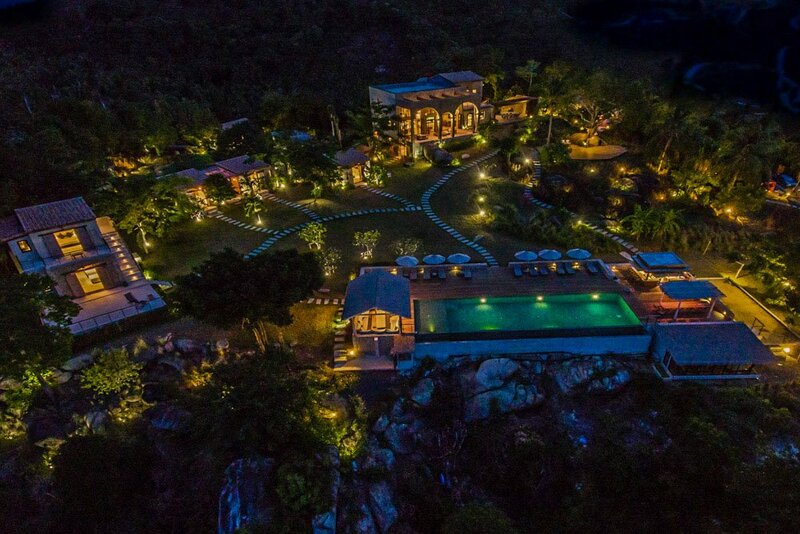 This is the perfect spot to do sun salutations while practicing yoga at sunrise or to host an intimate wedding ceremony.